If you have a cage for your pet lizard or frog, you can use the salt test to calibrate a hygrometer, an instrument used to measure relative humidity. Relative humidity is a measure of how much water the air is holding relative to the maximum amount of water the air could possibly hold at a given temperature. Because of the delicate design of hygrometers, it is easy for them to become inaccurate (e.g. with shipping or just over time). A simple method of calibrating your hygrometer will help ensure you are measuring the relative humidity as accurately as possible. 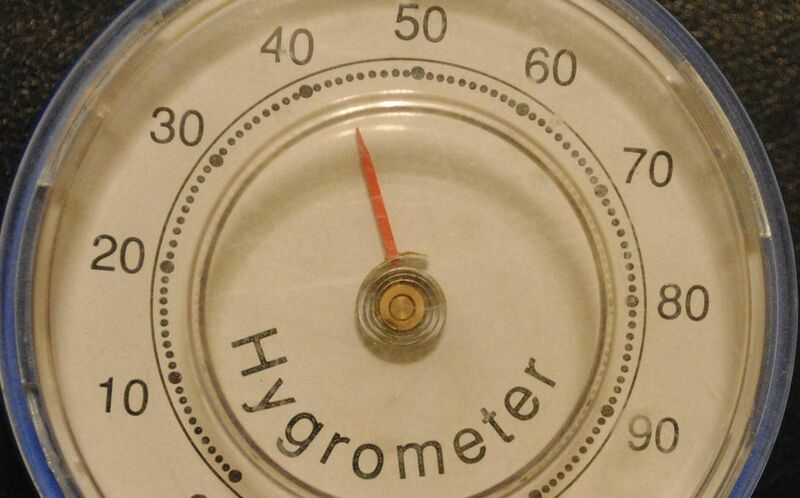 Hygrometers should be calibrated yearly. Hygrometers are available in both digital and dial models and both should be checked for calibration. Some dial types will have a small screw or adjustment on the back so you can adjust them after calibration. If there is no way to adjust them, make a note of the calibration result and then you can simply add or subtract from the actual reading to get a more accurate humidity level (this is discussed in greater detail after the calibration process is explained). Use the following series of diagrams to learn how to calibrate a hygrometer. The last page in the series provides a summary of the steps that you can print out for reference. Tip: Give a hygrometer about two hours to stabilize before taking a reading, as changes in the ​relative humidity may take a while to register accurately on a hygrometer. Place 1/2 cup of salt in the coffee cup and add the water. Stir for a bit to totally saturate the salt. The salt won't dissolve in this amount of water; instead, the salt should have the consistency of wet sand. Put Hygrometer and Salt Mix in a Bag. Carefully place the cup containing the salt/water mix in a re-sealable plastic bag. Place the hygrometer in the bag, away from the cup of salt and water. Note: make sure none of the salt/water mix comes in direct contact with the hygrometer, or the hygrometer may be damaged. Completely seal the bag. Place the sealed bag aside at room temperature for eight to 12 hours. Pick a location free of drafts, out of direct sunlight and away from heating or cooling vents. The temperature should be fairly constant. After being in the sealed bag for eight to 12 hours, check the reading of the hygrometer. It is best to read it while still in the bag. If your house air is dry the reading may go down quickly once you take the hygrometer out of the bag. The relative humidity in the sealed bag with the salt/water mix should be 75 percent. My hygrometer read about 72 percent. If yours is the adjustable type, adjust the screw or setting so that it would have read 75 percent. You will have to do this very quickly or remember how much you need to adjust the setting (e.g. for mine, it read 72 percent when it should have been 75 percent, so I would need to set it ahead by 3 percentage points). You may want to put the hygrometer back in the bag for another eight hours to double check your adjustment. Case 1: After sitting in the bag for calibration, my hygrometer read 72 percent. It should have read 75 percent, so the difference is 3 percent. I will now add 3 percent to the readings I take on the hygrometer (e.g. in a tank) to get the actual relative humidity. Case 2: After calibrating in the bag, a hygrometer read 80 percent. It should have read 75 percent, a difference of 5 percent. I would have to subtract 5 percent from readings when using the hygrometer to get an accurate relative humidity. Remember: Always give a hygrometer about two hours to stabilize before taking a reading, as changes in the relative humidity may take a while to register accurately on a hygrometer. 1. Place 1/2 cup of salt in the coffee cup and add the water. Stir for a bit to totally saturate the salt (the salt won't dissolve, it will be more like really wet sand). 2. Place the salt/water mix in a re-sealable plastic bag, along with the hygrometer, and seal the bag. Note: make sure none of the salt/water mix comes in direct contact with the hygrometer. 3. Sit this bag aside at room temperature for eight to 12 hours in a location where the temperature is fairly constant. 4. After eight to 12 hours, check the reading of the hygrometer. It is best to read it while still in the bag. The relative humidity in the sealed bag with the salt/water mix should be 75 percent (mine read about 72 percent). 5. For adjustable hygrometers, adjust to read 75 percent. You will have to do this very quickly, or remember how much you need to adjust the setting (e.g. mine read 72 percent rather than 75 percent, so I would need to adjust the dial up 3 percentage points). 6. If yours is not adjustable (like mine), simply make a note of how "off" your hygrometer reads. If it reads below 75 percent, you will need to add the difference to your actual readings. If your hygrometer read above 75 percent on the calibration, you will need to subtract the difference from your actual reading. In my example: after sitting in the bag, my hygrometer read 72 percent, when it should have read 75 percent -- a difference of 3 percent. I now add 3 percent to the readings I take on the hygrometer (e.g. in a tank) to get the actual relative humidity. Is it Safe to Use Bleach to Clean Exotic Pet Cages?